The training day took place as part of project 'Help me to Help you'. The project is supported by Philip Morris Fund. 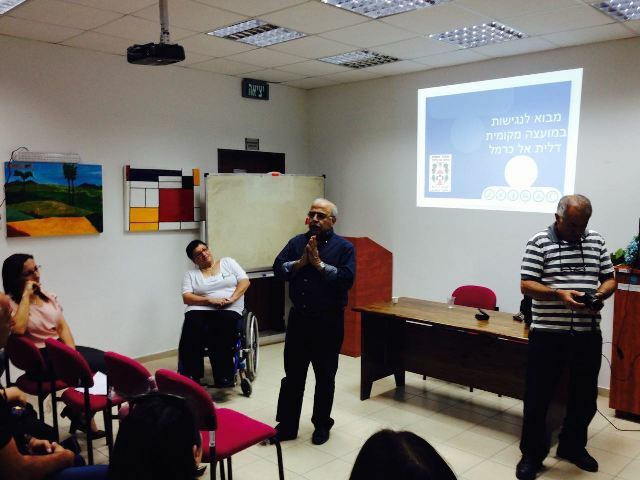 This initiative is one of the Accsess Israel flagship projects whose aims are to train those who provide services in the local community in Israel on how to provide accessible service for people with disabilities. This initiative has lately gained recognition to be one of the projects with the 'Best Practice' 2016. This recognition was granted by the UN DESA (United Nations Department of Economic and Social Affairs , New York. 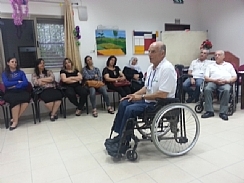 The event took place in the accessible building of the 'Daliyat Al Karmel Handicapped people' organization, headed by Salman Awad. The day started with the local Mayor Mr Rafik Chalabbi who illustrated the importance of Accessibility and the Acceptance of different people . The mayor spoke about the importance of creating an accessible environment for the town and the development of tolerance between the residence in the Dalyet El Carmel local council. Or Cohen, the head of Instruction and Training Department in Access Israel, and Dr. Revital Shurtz Swirski , the director of the 'Access Israel – North (A.I.N. )', spoke about their personal experiences and highlighted the values behind the need of accessibility especially when providing services to communities. After the talk, the main part of the training day started . This was the part were the audience were given the opportunity to experience various disabilities and enable direct conversation to truly understand the importance of accessibility for those people. Initially the participants entered a room blindfolded, in order to experience what it might be like to have a visual disability. While blindfolded the participants listen to the personal story of the visual impaired A.I.N. volunteer Shulamit Knanot. The workshop continued with the participants experiencing the barrier of hearing loss. 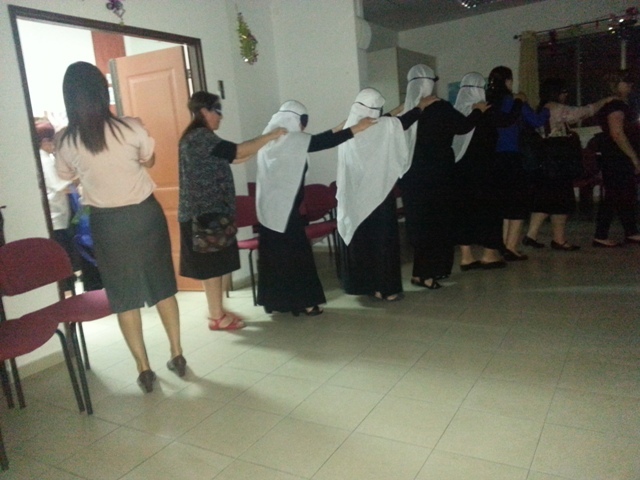 Participants were asked to complete tasks and communication games while their ears were blocked using ear phones. This workshop was delivered by hearing impaired A.I.N. 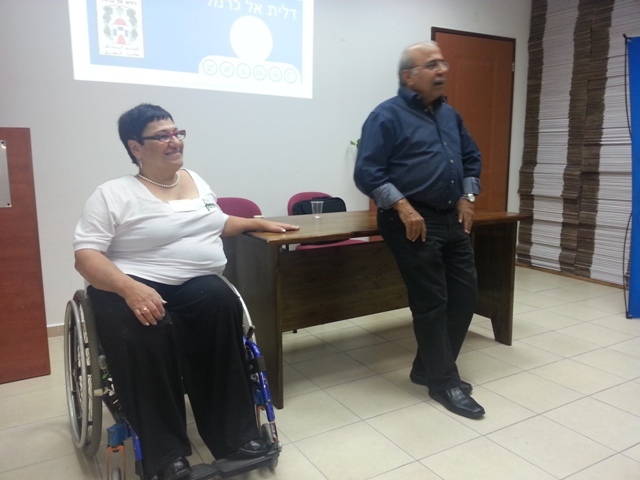 volunteer Smadar Harush, who shared her personal story with the participants. The whole event was extremely impressive. There were moments full of emotion and meaning. Participants reached the point were they needed to wipe their tears and compose them selves . The relationship and rapport between those who delivered the talks and workshops and the participant was excellent. At the end of the day there were warm exchanges of hugs and farewells, which were emotional. Access Israel would like to thank the Mayor Mr Rafik Chalabbi who acknowledged the importance and gave the green light to the training day. Thanks Salman Awad, the Head of the 'Daliyat Al Karmel Handicapped people' organization who donated it's accessible building for the event. Thanks to A.I.N. dear volunteers and our representatives that facilitated the workshops . Thanks to Mrs. Omima Abu- Zalef who without her support and commitment to the cause this project would have not taken place. Access Israel would also like to thank Philip Morris Fund on the faith and support of the project 'Help me to help you', in the fourth year. 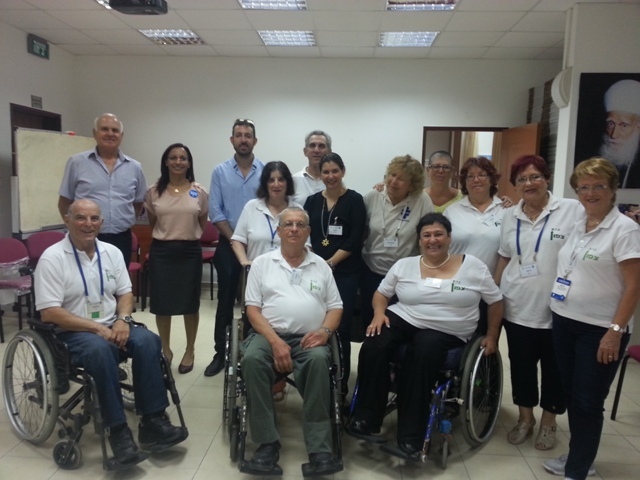 Access Israel would like to continue to expand the relationship that has built with the Druez community and to hold more training and workshops in the local municipalities across Israel throughout the different communities.